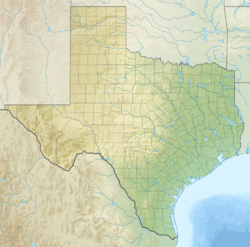 This article is about the largest city in the U.S. state of Texas. 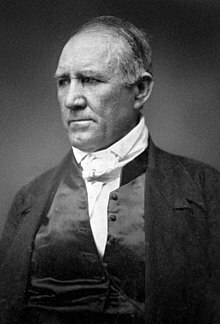 For other uses, see Houston (disambiguation). 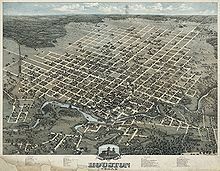 Houston (/ˈhjuːstən/ ( listen) HEW-stən) is the most populous city in the U.S. state of Texas and the fourth most populous city in the United States, with a census-estimated population of 2.312 million in 2017. 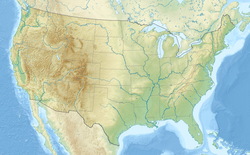 It is the most populous city in the Southern United States and on the Gulf Coast of the United States. 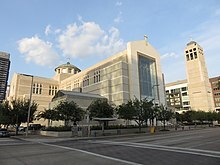 Located in Southeast Texas near Galveston Bay and the Gulf of Mexico, it is the seat of Harris County and the principal city of the Greater Houston metropolitan area, which is the fifth most populous metropolitan statistical area (MSA) in the United States and the second most populous in Texas after the Dallas-Fort Worth MSA. 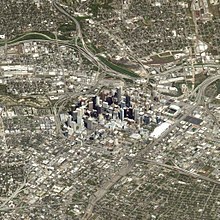 With a total area of 627 square miles (1,620 km2), Houston is the eighth most expansive city in the United States (including consolidated city-counties). 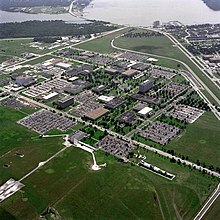 It is the largest city in the United States by total area, whose government is similarly not consolidated with that of a county or borough. Though primarily in Harris County, small portions of the city extend into Fort Bend and Montgomery counties. 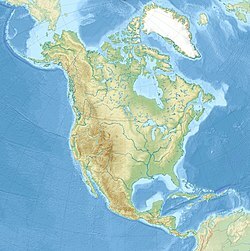 Houston has the fifth-tallest skyline in North America (after New York City, Chicago, Toronto and Miami) and 36th-tallest in the world as of 2015[update]. A seven-mile (11 km) system of tunnels and skywalks links Downtown buildings containing shops and restaurants, enabling pedestrians to avoid summer heat and rain while walking between buildings. Houston's multiculturalism, fueled by large waves of immigrants, has been attributed to its relatively low cost of living, strong job market, proximity to Latin America, and role as a hub for refugee resettlement. At least 145 languages are spoken by city residents. Greater Houston is one of the youngest metropolitan areas in the nation, with an estimated average age of 33.5 in 2014, compared with the national average of 37.4; the city's youthfulness has been attributed to an influx of Hispanic and Asian immigrants into Texas. As of 2017[update], an estimated 600,000 undocumented immigrants reside in the Houston area, comprising nearly 9% of the metropolitan population. The city controller is elected independently of the mayor and council. The controller's duties are to certify available funds prior to committing such funds and processing disbursements. The city's fiscal year begins on July 1 and ends on June 30. Chris Brown is the city controller, serving his first term as of January 2016[update]. As the result of a 2015 referendum in Houston, a mayor is elected for a four-year term, and can be elected to as many as two consecutive terms. The term limits were spearheaded in 1991 by conservative political activist Clymer Wright. During 1991–2015, the city controller and city council members were subjected to a two-year, three-term limitation – the 2015 referendum amended term limits to two four-year terms. 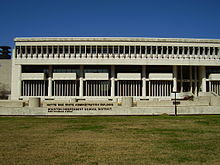 As of 2017[update] some councilmembers who served two terms and won a final term will have served eight years in office, whereas a freshman councilmember who won a position in 2013 can serve up to two additional terms under the previous term limit law – a select few will have at least 10 years of incumbency once their term expires. 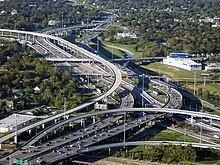 Three loop freeways provide north-south and east-west connectivity between Greater Houston's radial highways. The innermost loop is Interstate 610, commonly known as the Inner Loop, which encircles Downtown, the Texas Medical Center, Greenway Plaza, the cities of West University Place and Southside Place, and many core neighborhoods. The 88-mile (142 km) State Highway Beltway 8, often referred to as the Beltway, forms the middle loop at a radius of roughly 10 miles (16 km). A third, 180-mile (290 km) loop with a radius of approximately 25 miles (40 km), State Highway 99 (the Grand Parkway), is currently under construction, with six of eleven segments completed as of 2018[update]. Completed segments D through G provide a continuous 70.4-mile (113.3 km) limited-access tollway connection between Sugar Land, Katy, Cypress, Spring, and Porter. Houston has the largest number of bike commuters in Texas with over 160 miles of dedicated bikeways. The city is currently in the process of expanding its on and off street bikeway network.[when?] In 2015, Downtown Houston added a cycle track on Lamar Street, running from Sam Houston Park to Discovery Green. In August 2017, Houston City Council approved spending for construction of 13 additional miles of bike trails.